On Saturday I took my parkrun course total up to 10. The last three new parkrun courses I’ve added to my total have been ticked off over these Summer holidays…I’ve really gotten into this parkrun tourism malarkey! Just need some more to pop up nearby now! The new Kettering parkrun course (about a 20 minute drive away) has been announced to start on 24th September. Best just hope I’m still running by then! As most weeks, this week I headed to parkrun with Laura, who had already run the Market Harborough course, so filled me in on the route as we were walking over for the briefing. At the briefing we were told that the Market Harborough parkrun had recently put in a bid to the British Heart Foundation for a grant for a defib and training kit which had been successful. The parkrun will be putting on sessions to train anybody who is interested in learning how to use the kit. 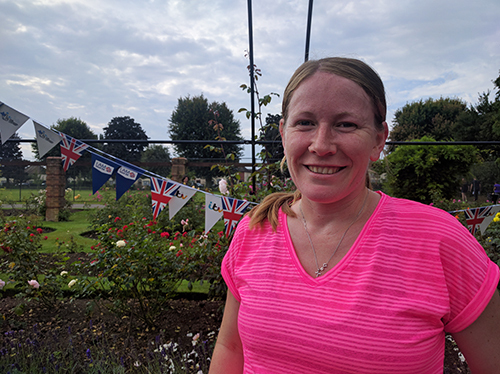 At their very first parkrun back in April 2015 a man collapsed, and the air ambulance had to attend the event. The gentleman recovered, but not what you expect to happen at your first event. Makes you realise just how important it is to keep your ICE number on your barcode up to date. Laura tried to explain the course to me on the way over but I got confused, although being towards the back of the pack is never an issue as you can always just follow the person in front of you! Basically, I think we ran a little section, then three big loops before cutting off to head towards the finish. I think(!) 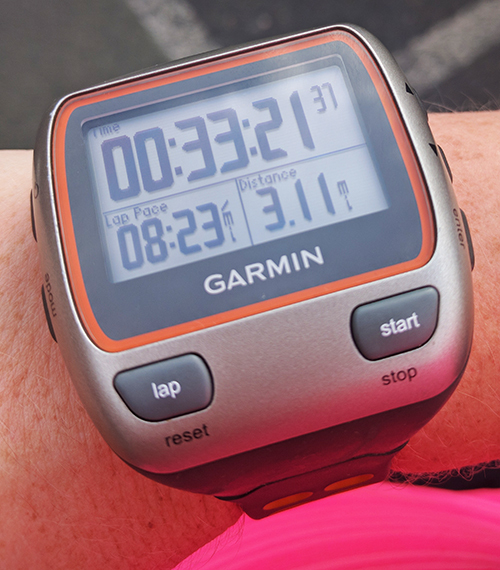 I just kept running until my watch said 3 miles and then took the finish turn! The route takes you through the beautiful gardens at Welland park along a narrow track. Although completely flat (just 4ft elevation in total), I can’t imagine it being a particularly fast course as there were quite a lot of turns and the path was only wide enough for two people to run alongside each other. We were slightly bottlenecked at the beginning, but it gave me a chance to warm up properly and let my legs wake up a little. Everybody overtaking had to step off the track and run along the grass to get past those in front of them. Despite this, and the large numbers of runners (273 in total), the run had a lovely atmosphere, and a proper community vibe about it. As the course was three laps, it meant that nobody was ever alone and you weren’t always entirely sure which lap those around you were on either! There was a little bit of a queue to get scanned at the finish, but nobody seemed to mind, and everybody was chatting to those around them in the queue. One of the barcode scanners was actually the guy who came through the finish first, which is always nice to see. Another Royal Flush Negative Split and my fastest parkrun since April! I’ll take that at nearly 35 weeks pregnant! Sweaty pic of me at the finish. Copies of Runner’s World and Men’s Health magazines were being given out at the finish, although as we were a little while getting there, Laura got the last copy of Runner’s World. I spotted quite a few runners dotted around the park on various perches settling down to read through the magazines after their run! We couldn’t spend too long mooching around Market Harborough (which incidentally seemed like a really nice town) as Laura and I were heading to Jeyes in Earls Barton with Steph to celebrate her engagement. This called for Afternoon Tea. 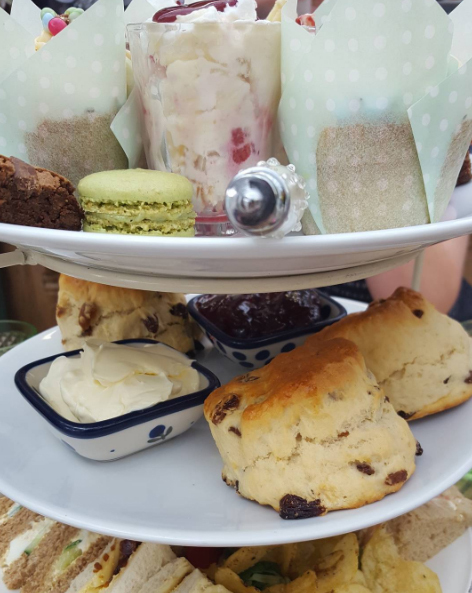 We’ve decided that it is our mission to test out all of the Afternoon Teas in Northamptonshire during the coming months. Laura is returning from injury, Steph is still injured and I’m about to have a few weeks where I won’t be able to run following childbirth…but we can still all eat cake! Sandwiches were; egg and cucumber, ham and tomato, salmon and cream cheese and cheese and pickle. I couldn’t have the salmon ones, and I don’t like pickle, but Laura swapped me one of her ham and tomatoes instead. Sandwiches were accompanied by a helping of salted crisps and salad. Next up was the scone layer. Jam always goes on before the cream. Top layer was a mini brownie, a mini macaroon (I went for the coffee one), an eton mess (best dessert ever) and a cupcake. We were all struggling by the end, and it took a long while to pick through the final desserts! Do you enjoy Afternoon Tea? What must it include in your opinion? Are your ICE details on your parkrun barcode up to date? My parkru tourism has dropped off- I started off so well this year but then my dad and brother are not always free and there are a few we want to run together, plus I have been helping at my two local ones quite a bit. 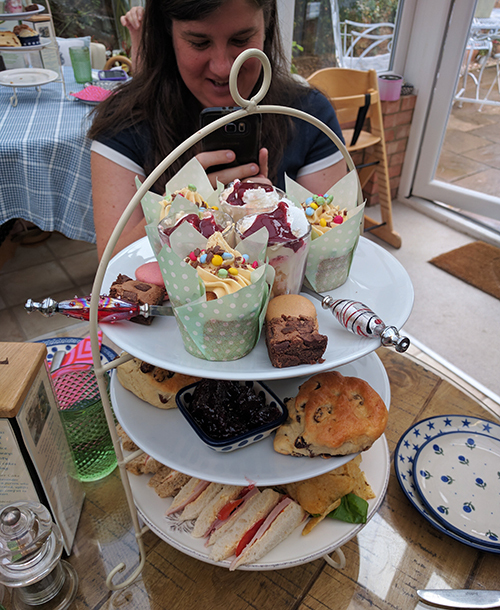 Afternoon tea is the best! Two of my uni friends always meet up with me for it – we tend to meet in London as there are a lot of options. I don’t like cream though, so I just have jam! I bought some of the plastic parkrun barcodes so I put Andy’s mobile on there are my ICE- I keep the big credit card sized one in my phone so that if I am out running and not at parkrun the details are there too. It’s so important though. Ooo, scones are not the same without jam AND cream! 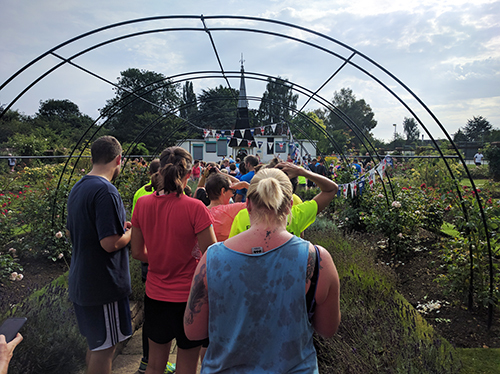 It is difficult to get organised for different parkruns – I’m hoping to fit in a few more this year yet, but it’s getting more and more difficult the further afield we go. That’s a good idea about putting one of the barcodes in your phone. I should probably add an ‘ICE’ option in my contacts actually now that you mention that. This is literally all my favourites in a post. Thank you. 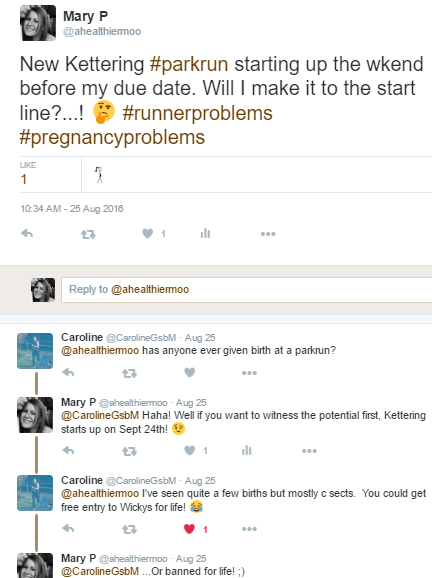 Wouldn’t that be hilarious if you did give birth during parkrun? In fact, as long as everything goes OK, I kinda wish you would. For the blog, please try 😉 (I’m joking… though it would be an EXCELLENT story). Firstly, I appreciate the multiple afternoon photos. I hate it when people blog about an afternoon tea and DON’T provide photos. I want to vicariously live through it so need visuals to help 😉 (OK this is my third winky smiley, I need to stop). I also appreciate you saying what you chose and I was trying to work out what I’d go for. And yes, absolutely, jam before cream. Anyone who does otherwise is a cake heathen. I always say it, but I’m so jealous of how many parkruns you live close to. And within running distance too!